An ounce of protection can go a long way. Taking a proactive approach to overall tank management – from installation to regular checkups – will protect your customers. Many companies already do regular tank inspections and have procedures in place for proper installations. Getting your people NORA GOLD TANK CERTIFIED is one way to demonstrate your commitment to your customers, potential customers and, in many cases, your insurance company. Unfortunately, many people in the Oilheat business view fuel oil storage tanks as the Achilles’ heel of our industry. While these people have valid concerns, the fact is that properly installed and maintained storage tanks are incredibly safe. 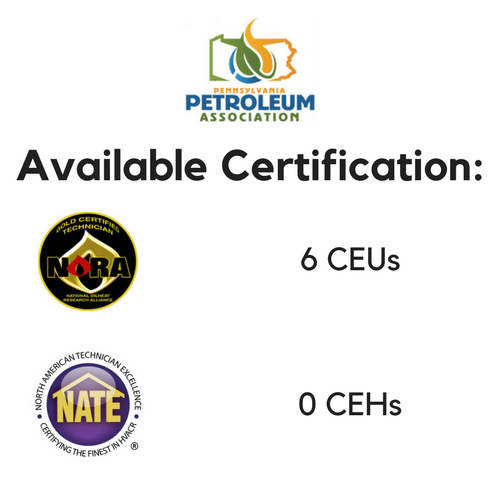 By having your technicians or anyone in your company who does tank inspections/installations, NORA Tank Certified, your company’s name will go into the NORA Tank database. It will be visible to your customers, potential customers and to insurance companies. All attendees will utilize the NORA Oil Tank Manual, Heating Oil Storage Tanks Guide for Quality Installation and Maintenance. Our Instructor: John Levey of Oilheat Associates will be presenting this informative seminar. John is a consultant and educator with over 39 years’ experience in the Oilheat industry.